I kept seeing glimpses of yellow feeding at the Mealworm feeder that is usually only used by the Bluebirds. Hmmm… It looked very much like a American Goldfinch but they don’t eat at that feeder and the coloring was a bit off. Phil and I had downloaded the IBird Pro app on our phones a while back which we love. A few weeks ago we discovered that it has a new feature called Sleith Photo Recognizer. You open the app, take a photo of the bird and it will recognize it for you. Many times I will have a photo on my camera or my computer, so I take a photo of that. It is awesome! And it has identified all of the birds that I did not know. 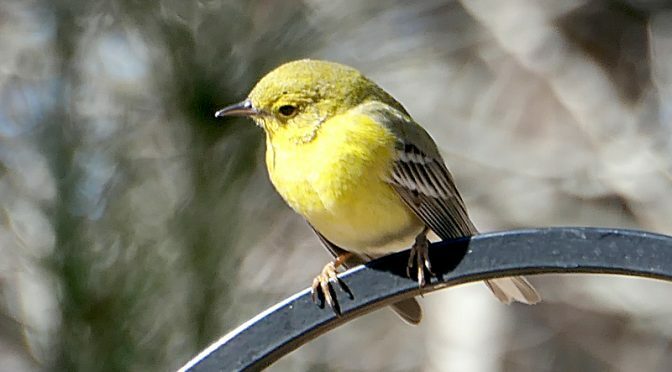 So, I went to the Sleuth Photo Recognizer and it identified it as a Pine Warbler. Amazing! I had never seen one here on Cape Cod before, so I added it to my iBird Pro Backyard List. Very cool, don’t you think? Beautiful Little Black-Capped Chickadee In Our Yard On Cape Cod. 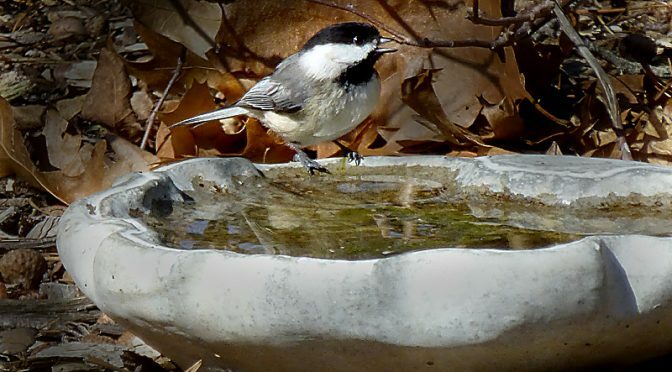 This Black-capped Chickadee was enjoying a drink at the little birdbath which we put in our yard last summer, thinking the little chipmunks and squirrels would like it to get a drink. Little did we know that birds of all sizes from the little Chickadees to the Northern Flickers love it too! 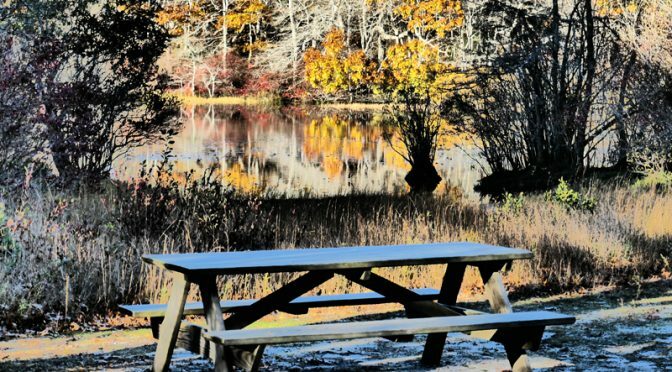 Brown-Headed Cowbirds Searching For Seed In Our Backyard On Cape Cod. 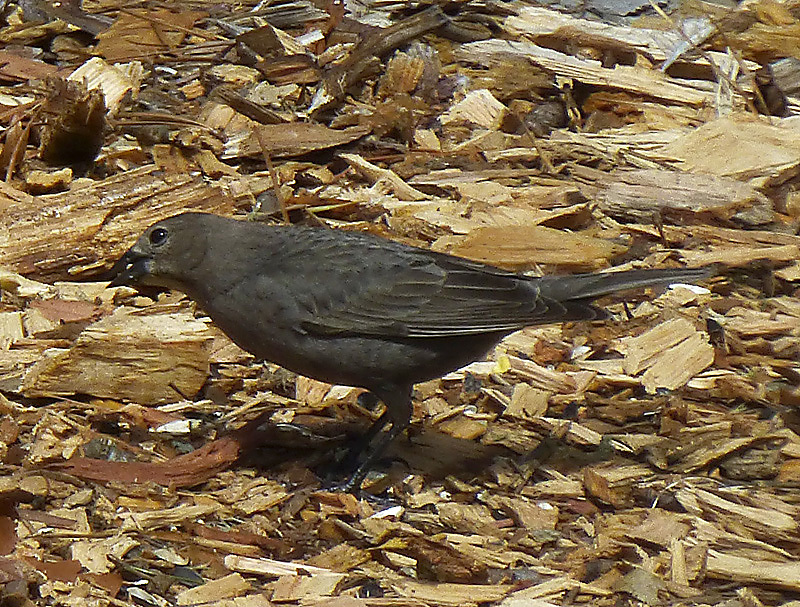 It was such a treat to see both the male and female Brown-headed Cowbirds in our yard searching for seed. I haven’t seen them since last summer. You can see in the 2nd photograph how different the male and female look. The male Brown-headed Cowbird is a small blackbird with a glossy brown head, a thick bill, and dark eyes. Its black body has a slight green sheen. It walks on the ground foraging for food. The female is all brown with a thick bill, as you can see in the 2nd photograph. 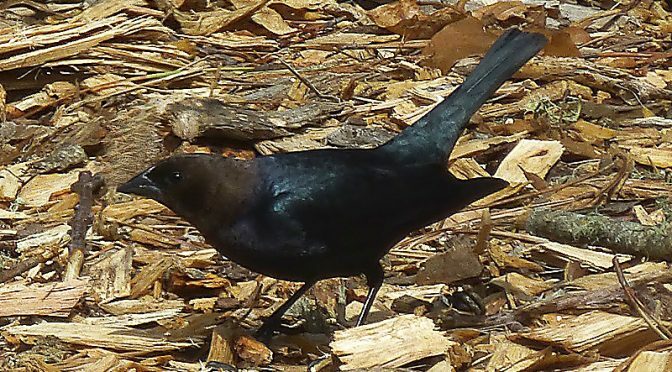 Have you ever seen a Brown-headed Cowbird? 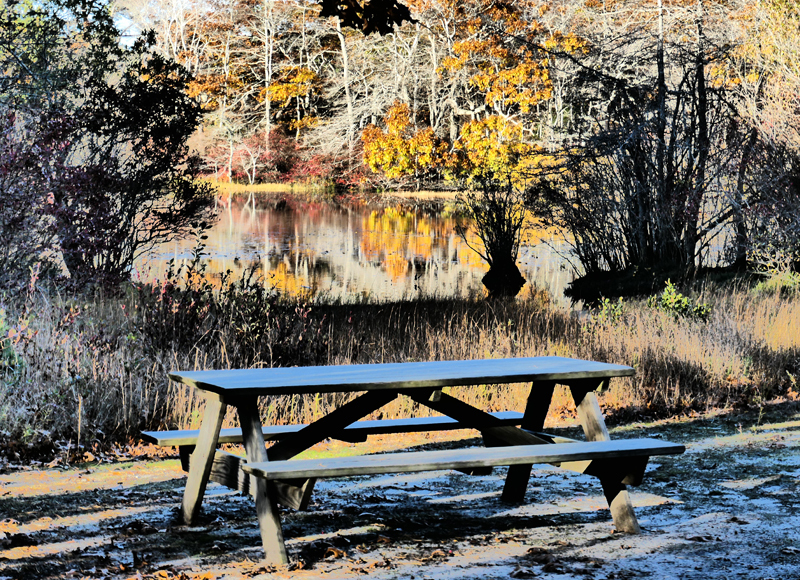 Skating On Our Birdbath On Cape Cod…Looking For A Drink Of Water! We looked out the window the other morning and had to laugh. 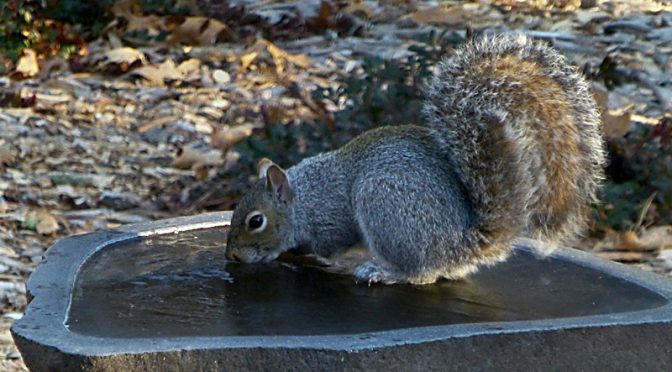 There was a squirrel walking around on the ice that had formed on our birdbath, looking for a drink of water. Oh dear! We had put our birdbath heater away too soon! We thought, perhaps, that spring was almost here and the nights would not freeze anymore, but we were sorely mistaken as you can see this squirrel skating on our birdbath! 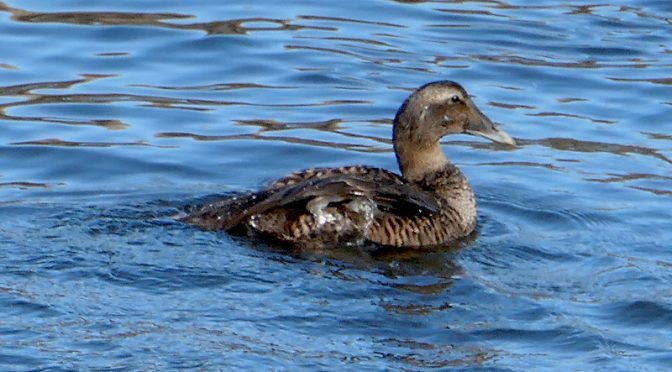 Common Eider At Boat Meadow Creek On Cape Cod. Have you ever seen a Common Eider?